“Insurgent” stars are living it up this summer! The movie’s leading actors Ansel Elgort, Octavia Spencer, Zoe Kravitz, Miles Teller and Keiynan Lonsdale are documenting their time on set and taking you along for the ride. The hot cast shared a series of photos this week via Twitter and Instagram. “Farewell @octaviaspencer so awesome hanging w you! 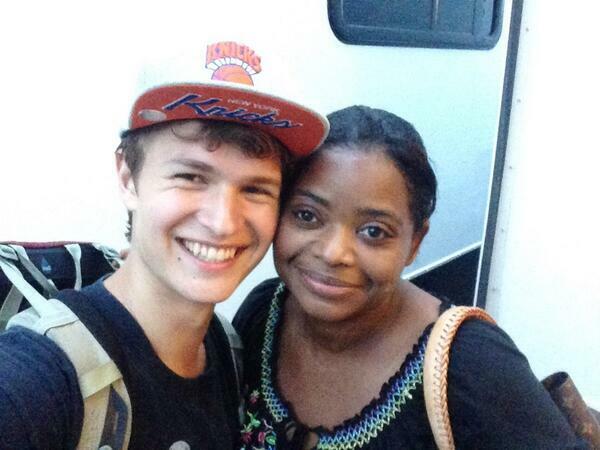 #Insurgent,” said Ansel in the caption that accompanied his selfie with Octavia Spencer above. “Insurgent” hits theaters March 20, 2015. All rights to the photos belong to their repective owners listed above. This entry was posted in Movies, News and tagged Ansel Elgort, Insurgent, Keiynan Lonsdale, Miles Teller, Octavia Spencer, Zoe Kravitz. Bookmark the permalink.